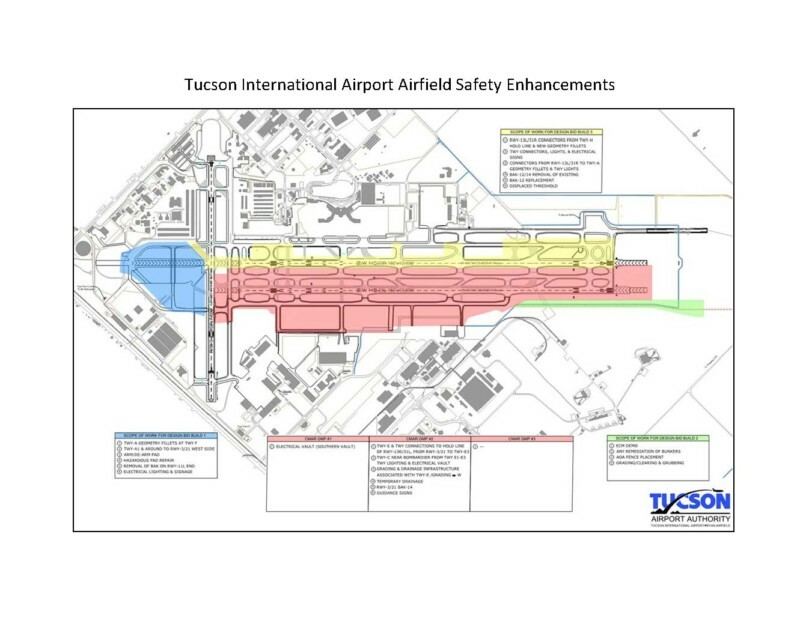 After eight years of preparation, a major project to enhance airfield safety at Tucson International Airport (TUS) has been given formal approval to proceed from the Federal Aviation Administration (FAA) and the U.S. Air Force. The airport’s Airfield Safety Enhancement project, currently estimated at $218 million, is the largest ever undertaken in the 70-year history of the Tucson Airport Authority (TAA). It includes demolition of a narrow and short general aviation runway to be replaced by a full-length parallel runway, construction of new taxiways and connector taxiways, installation of aircraft guidance systems and modernizing the geometry of the airfield to the latest FAA safety standards. Allin thanked the Federal Aviation Administration for its efficient work on developing the environmental impact statement. The improvements will bring the airport’s airfield to FAA’s latest safety standards. “The basic construction of this airport was done more than 60 years ago and, just like a highway project that needs to be updated and widened, it’s time for us to the same for this airport,” said Mike Smejkal, TAA’s Vice President of Planning and Engineering. Integral to the project are some land transactions that include transferring about 58 acres of U.S. Air Force land to the TAA for the parallel runway safety area, moving 160 acres from the TAA to the Air Force to provide a safety buffer for Raytheon’s Plant 44, and replacing munition storage bunkers. Additionally, local government entities are interested in purchasing approximately 290 acres of TAA land to make it available to Raytheon for potential future expansion. 2010 – TAA conducts study of need for airfield safety improvements at TUS. 2015 – TAA completes TUS Master Plan Update that includes and validates the need for airfield safety enhancements. August 2016 – TAA files Notice of Intent to pursue airfield safety enhancements. September 2016 – Federal Aviation Administration holds scoping meetings for the public and federal, state and local regulatory agencies. Fall 2017 – FAA issues draft Environmental Impact Statement based on comments received after scoping meetings. Spring 2018 – Public Hearing and Workshop held. November 28, 2018 — FAA Issues Record of Decision giving formal approval for the project to proceed. Late 2022/2023 – New full-length parallel runway expected to be operational. 2024-2025 – Construction of all projects expected to be completed. The Tucson Airport Authority (TAA) is an independent, non-profit organization operating Tucson International Airport (TUS) and general aviation reliever Ryan Airfield (RYN). TAA has sustained its operations since its origin in 1948 from airport generated revenues without the use of local taxes, and continues to invest millions of dollars each year in safety, security and facility infrastructure that drives job creation and economic activity for the benefit of Tucson and southern Arizona. The two airports currently support 35,000 jobs and house more than 100 tenants, and serve a diverse mix of both aviation and non-aviation related businesses, as well as military and government operations.